Big Sale! $50 or $5 off with coupon! Spring is just around the corner which means sailing out on Penobscot Bay in Camden, ME is soon to follow. Here's a little something for you to help welcome in the warmer weather and think summer! As a thanks to all who have booked with us previously, and because we're so excited that spring is just around the corner, we are offering discounts on our charters and sails booked between March 15th, 2015 and the March 31st, 2015. Book your charter between these dates and receive $50.00 off! This deal applies to both the Olad and the Owl. On top of this we are giving a discount of $5.00 off any tickets purchased between these dates as well! This deal also applies to both of our sailboats. For the charter discount use coupon code 15Charter50. For the ticket discount use coupon code 15Ticket5. Thanks so much and happy savings! If you are interested in joining us aboard the Olad or Owl for a private sail, please don't hesitate to give us a call for more information. We will be booking up quickly as we get closer to season, and we want to make sure you get your preferred day of sailing in. Feel free to call us directly at 207-236-2323, send us an email at [email protected] or visit www.maineschooners.com to make a reservation. May the warm weather find us...Cheers! Getting the Olad and Owl ready for spring! Winter greetings! We are almost through February which apparently has been a record breaking month for cold temperatures here in Maine. Good job everyone for sticking it out. The cold is definitely not for everyone, and frankly we are about ready to call Uncle! This is the time of year where we begin thinking about what needs to be done on the boats for the upcoming season. This means lots of hours in the wood shop with sand paper and varnish. It's a thankful break from my hours in the office...I love to get my hands dirty. We are continuing to book private charters aboard both the Olad and the Owl for the upcoming season. We are fortunate to have another couple getting married on the Olad this year, and we are so excited! We also have family reunions and 1/2 day picnics and lobster bakes scheduled for Warren Island State Park which is always a highlight of our summer. If you are interested in joining us aboard the Olad or Owl for a private sail, please don't hesitate to give us a call for more information. We will be booking up quickly as we get closer to season, and we want to make sure you get your preferred day of sailing in. Feel free to call us directly at 207-236-2323 or send us an email at [email protected]. May the warm weather find us...Cheers! It may be snowing and cold here in Camden, Maine, but eventually the summer sailing season will be upon us again. Why not warm your honey's heart on Valentine's Day with a gift certificate for a two hour sail this summer aboard the schooner Olad or the Cutter Owl? Receiving a gift of sailing on a bright summer day is sure to bring warmth and light to a cold February holiday. You're sure to get many points for the thoughtfulness! If you'd like to purchase a gift certificate or inquire about a sail this summer please call us at 207-236-2323 or visit our website www.maineschooners.com. We would love to answer any questions you might have about sailing this summer on one of our beautiful wooden boats in Penobscot Bay. A very happy Valentine's Day from the Schooner Olad to you and your sweetie! Well, at least it's almost February, and at least we love our skiing. I'll take a blizzard in January over a hurricane in July any day. It's blowing a serious stink on the other side of my window right now. The snow's blowing 'right sideways' as a local Mainer would say. My snowboard is going to touch the white stuff for the first time this weekend. You all can have your Super Bowl(go Patriots! )...that just means the mountain will be empty. More ski time and freshies for me! While this storm slowly makes it's way across the North East, I'll stay cozy inside with my coffee and scheme on some special sailing events that we'll be having aboard the Schooner Olad and the Cutter Owl. Maybe we'll win the Great Schooner Race in July with the Olad, or even the Eggemoggin Race with the Owl in August. Either way, it'll be awesome to spend the day under sail in Penobscot Bay off the coast of beautiful Maine with some wonderful people. If your dreaming about sailing this summer like we are, take a look at our special events page or find the perfect excuse to celebrate with a private sail aboard the Owl with a few of your closest friends. 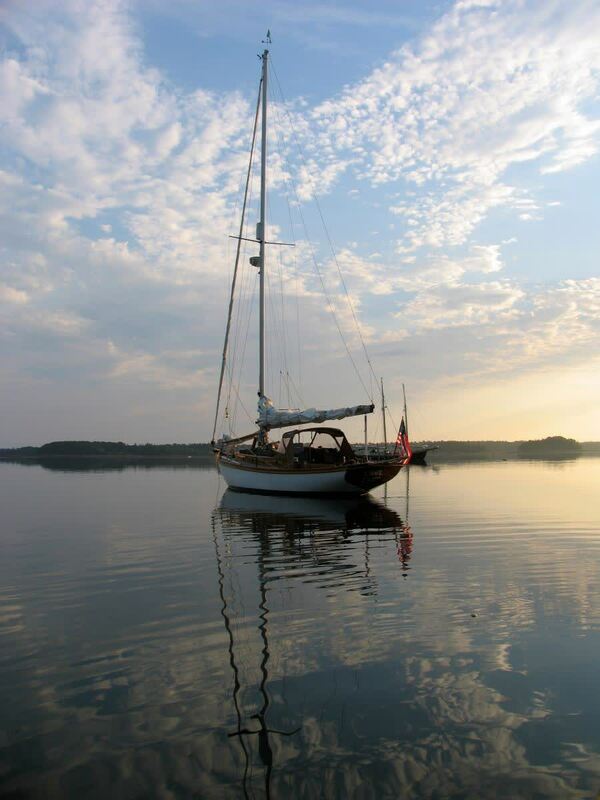 We are happy to help you plan the perfect sail, whether it's a 2 hour sail along the coastline or a full day sail and picnic or lobster bake on Warren Island State Park. The possibilities are practically endless. Feel free to give us a call, 207-236-2323 or send us an email, [email protected] if you have questions or would like to book a speciail sail. Until then, we'll keep scheming up some fun sailing adventures for our guests to enjoy. Safe and warm wishes to everyone who is enduring the blizzard of 2015! It is a quintessential day here in Maine. The snow is lightly falling and begs for help in the making of a snowman or fort. The Camden Harbor is quiet and still with a light layer of ice around the shore. This weather leaves me dreaming of a summer day sailing cruise on Penobscot Bay, and maybe a picnic or lobster bake on Warren Island. All of this dreaming has lent itself to a great offering of special events for this coming summer season. We have many old favorites as well as some new offerings this year. Please check out our full list of great events here on our website. Reservations are suggested as many of our special events book well in advance. In addition to our public special events we are also currently taking advance reservations for many private charters for this coming summer. We would love to take your wedding party on a pre-wedding day cruise or for your big day. Our captain, Aaron Lincoln is a notary and is happy to officiate your wedding in one of the most beautiful and memorable locations in Maine; Penobscot Bay. A private sailing charter is also a great way to show your appreciation to your employees or for any special occasion. We will work with you to create a great experience for your group that they will be talking about for years to come. Please feel free to contact us with any questions via phone 207-236-2323, or email [email protected]. From all of us at the Schooner Olad and Cutter Owl, we wish you very Happy Holidays from Camden, Maine! May this season bring you much joy and cheer...and skiing! We would like to thank all of our friends, family, and return guests for making this year a huge success, and for supporting us over the years. We could not have done it without all of you. We are looking forward to many years of sailing in Penobscot Bay to come. Great gift for the 2014 Holiday Season! Full day sail aboard the Schooner Olad! As we turn the calendar to September, and anticipate cooler nights and fall foliage, we are still enjoying beautiful days sailing in Penobscot Bay. Fall is a wonderful time of the year to sail and we are looking forward to many days of sailing yet to come until the end of our season. On September17, 2014 the Schooner Olad will celebrate Maine Lighthouse Week by taking a full day sail to the Rockland Breakwater Lighthouse. The Olad will leave Camden Harbor at 10am and make it’s way to Rockland. Watch for the Windjammer Fleet enjoying the breeze, lobster boats at work, and sea life out in Penobscot Bay. We will tie up to the lighthouse dock and have a guided tour of the Rockland Breakwater Lighthouse. After the tour we will board the schooner and take a sail back towards Camden to return at 5pm. On the way back, feel free to take some time at the helm or just enjoy the nature and wildlife as the boat sails on. Lunch and snacks will be provided for this full day sail, but please feel free to bring your own snacks and beverages of any kind. 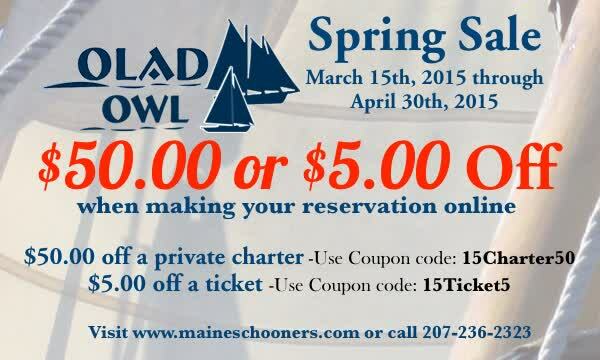 Please call 207-236-2323 to book a reservation or visit our website maineschooners.com for more information. The 2014 Windjammer Festival is almost here! If you have never been in town for the annual Windjammer Festival I strongly recommend checking it out this year as it is a very exciting and enjoyable weekend long festival. Windjammers from up and down the coast of Maine sail into Camden harbor to celebrate the area’s maritime history and culture. There are many exciting events throughout the weekend such as fireworks, lobster crate races, build a boat contests, and more. In addition to these exciting events you will have the opportunity to see the gorgeous Windjammers, many of which only come to the harbor once a year for this event. The Schooner Olad is offering several special sails throughout Windjammer Weekend that you do not want to miss! Join us on one of our Windjammer Festival Sail-in trips on Friday, August 29th from 12-2PM or from 2:30-4:30PM where we will sail among the entire Windjammer fleet as they enter Camden harbor for the weekend. On Friday we will also be offering a Fireworks Sail from 7-9:15PM where you can join us for a trip to watch the breathtaking sunset followed by the fantastic fireworks display over the beautiful Camden harbor. Finally, on Sunday, August 31st from 2:30-4:30PM the Schooner Olad will be participating in the Parade of Sail with the entire Windjammer Fleet as the ships sail around Camden harbor and out into Penobscot Bay. For more information on these amazing trips or to purchase your tickets today visit our website at or call us at (207) 236-2323.